Parham House and Gardens in Pulborough is set to reopen next month with two days of fun family activities. 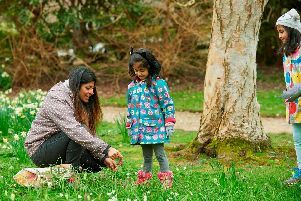 Visitors to the beautiful Elizabethan House can enjoy a garden trail, face painting, craft activities and storytelling on Sunday and Monday, April 21-22. The venue will be open from 10.30am to 5pm. This is only a small part of what Parham has in store for 2019. Other events throughout the year include special house tours, which take place on Friday, April 26, and Friday, August 9 (10.30am, £19.50). People can see Parham’s rare collection of paintings, furniture and needlework, and learn about the family home’s fascinating history. There will also be one-hour guided Clock Tours on Friday, May 3, and Friday, September 6 (10.30am, £15), where people can learn about the house’s timepieces, as well as the stories behind them. From May 22 to June 2 visitors can see Parham’s embroidery collection, which includes items that are not usually on display. This year’s artist-in-residence, the photographer Elizabeth Zeschin, will hold her exhibition from June 5-30 (2pm-5pm) in The Seed Room. Parham is also taking part in The Horsham District Year of Culture 2019 with Gordon Rushmer’s One Man Exhibition from September 1-15 (2pm-5pm) in The Seed Room. This will include a stunning display of the award-winning landscape painter’s watercolours. To find out more about Parham visit www.parhaminsussex.co.uk. 10 things to see in West Sussex, March 29 to April 4: in pictures. Click here to find out more.